SCVHistory.com LW3431 | Film-Arts | William S. Hart, Alma Rubens Star in 'Truthful Tulliver' (1917). Charlie Chaplin was pulling down $630,000 a year and Doug Fairbanks was being offered $750,000 when the William S. Hart vehicle, "Truthful Tulliver," opened at the 81th Street Theatre in New York City on January 7, 1917. Hart was still a $1,000-a-week player at Triangle, and even that was a far sight better than the $250 a week he was making a few short months earlier. That was about to change, though, thanks to an offer from Adolph Zukor at Famous Players. Triangle boss Harry Aitken countered, and by the spring of 1917, Hart was enjoying the rarefied air with a $10,000-a-week contract with Triangle Film Corp.
As for the other member of that famous quartet, Mary Pickford, she'd been washed overboard in a boating mishap during the filming of "The Pride of the Clan," which opened at the Strand on the same day as "Truthful Tulliver" (and which isn't what it sounds like). 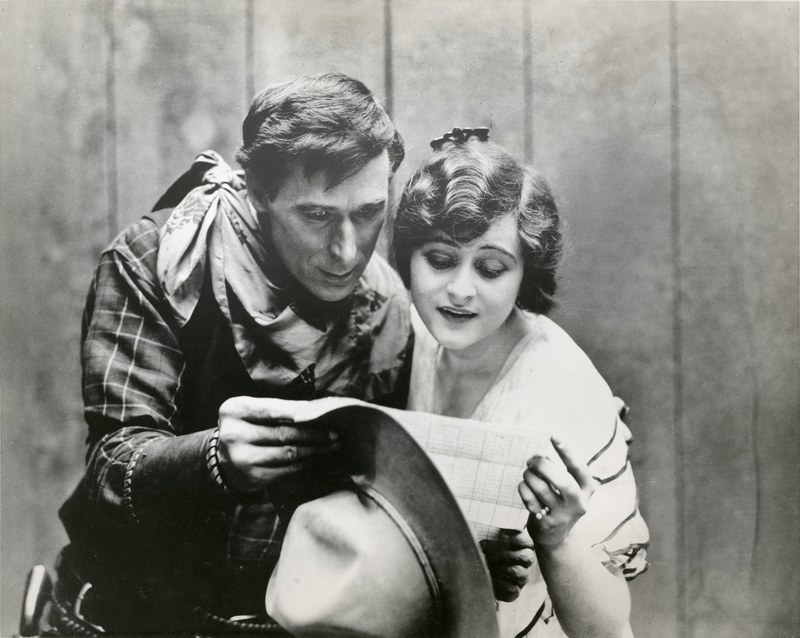 Hart plays the title character and Alma Rubens (1897-1931) plays the love interest in "Truthful Tulliver," where Tulliver is a frontier newspaperman who runs a rotten scoundrel of a saloon owner out of town. But he does it phyically, not with his broadsheet. Apparently the phrase, "use your words," hadn't yet entered the popular lexicon. Hart was at the height of his popularity and was turning out one winning picture after another. Europe was at war, and America was sharply divided in the hot debate over whether to enter. Audiences were attracted to stories of right and wrong, good vs. evil, with the perceived wholesomeness of the "authentic West" as a backdrop. "No actor before the screen has been able to give as sincere and true a touch to the Westerner as Hart," wrote the New York Press (quoted in Davis 2003:88). "He rides in a manner indigenous to the soil, he shoots with the real knack, and he acts with that sense of artistry that hides the action." Tastes would change after the war — and Hart wouldn't. But that's another story. Produced by Triangle/Kay-Bee under the supervision of Thomas H. Ince; distributed by Triangle; in production August 9 &dash; September 23, 1916; released January 7, 1917; five reels. Directed by William S. Hart; story and screenplay by J. G. Hawks; photographed by Joe August; art director, Robert Brunton. CAST: William S. Hart ("Truthful" Tulliver); Alma Rubens (Grace Burton); Nina Byron (Daisy Burton); Norbert A. Myles (York Cantrell); Walter Perry ("Silver Lode" Thompson); Milton Ross ("Deacon" Doyle). SYNOPSIS: Truthful Tulliver, a Westerner and a journeying newspaperman, followed by Silver Lode Thompson, printer and compositor, arrives in Glory Hole to start a newspaper. He is visited by York Cantrell, an Easterner, whose mining interests keep him in the vicinity. They stand at the office window watching two sisters, Grace and Daisy Burton. The girls are insulted by men hanging around the Forty Rod saloon and dance hall, run by "Deacon" Doyle and secretly [owned] by York Cantrell. Tulliver rushes to their assistance and incurs the enmity of Doyle. The next day Truthful states, under big headlines, that Doyle must go, and the following morning finds a notice on his door that Doyle will be in the Forty Rod saloon at ten o'clock, and there is not a pen-pusher in Arizona that can run him out of town. Truthful surprises Doyle and his henchmen by coming in the saloon through a rear door, and from his horse, lassoes and pulls them out into the desert, where he tells them never to return to Glory Hole. That night Truthful is shot at from York Cantrell's room by Doyle, who has returned. Truthful then drives both from town, not knowing that York has wronged Daisy Burton. Daisy confesses to Grace, and Grace finds Truthful, who, misunderstanding, thinks she is the one who cares for Cantrell. He promises to bring him back, and reaches the railroad, intercepts Cantrell, and forces him to return. LW3431: 9600 dpi jpeg from copy print purchased 2017 or 2018 by Leon Worden. 8x10 inches, older, probably 1950s-1960s.